The AirStep hullform is offered for Bénéteau’s higher-speed (35 knots and higher) powerboats, including this Barracuda 23 (7m). The old saying that there’s nothing new under the sun certainly has variants. Tracing a succession of patents on stepped powerboat hullforms, proves it. Professional BoatBuilder has covered this topic nearly since the magazine’s inception. The development of the AirStep hullform by French builder Bénéteau over the past few years prompted me to check the PBB index. In PBB No. 5 was our first report on stepped hulls; Pete Smyth summarized their history, noting the first U.S. patent was issued in 1905 for multiple steps or “shingles,” as they were sometimes called. Later, in 1925, the 26′ (7.9m) Gold Cup contender Delphine IV was built by the Horace L. Dodge Boat Works of Detroit, Michigan. El Lagarto, built in 1923 by John L. Hacker of Mount Clemens, Michigan, won the Gold Cup with a stepped hull several years running in the early 1930s. Some attempts to reduce drag by ventilating the running surface with air were successful, others outright disasters. A common problem was stability in turns. Of Delphine IV Smyth wrote: “A change of a mere 1⁄8″ [3mm] transformed her from a porpoising fool to the winner she was.” An early effort to understand the form was by Lindsay Lord, author of The Naval Architecture of Planing Hulls (1946). Alternatively, you may also revisit Lorne Campbell’s Notes on Stepped Hulls, elsewhere on this website. Inventor/designer/boatbuilder Harry Schoell (PBB No. 160) experimented with numerous prototypes to develop his Delta Conic and Duo Delta Conic hullforms, focusing on angle of attack of each plane, deadrise of each plane, a flat or inverted V section aft, width of chines (for control), and shape of steps to facilitate venting. Different methods have been employed to introduce air: notches in chines, directing engine exhaust to that area of the running surface; and ducting from above. At a 2016 IBEX seminar, Schoell simplified the discussion by saying, “It’s all about angle of attack.” For his Duo Delta Conic, the angle of attack of the after plane is slightly less than that of the forward plane, but the relationship of the two, and of the other factors, he says, is critical. His Senza Spectre for Larson won a Boat of the Year award in 1991. At that same IBEX session, Rob Kaidy shared drawings of his and Ralph Torres’s patented two-step cross-ventilated hullform for SeaVee Boats, featuring SpeedRails. The patent abstract reads in part: “The hull may include a longitudinal centerline extending from bow to stern, a first and second transverse air channel that are fluidly isolated from the rest of the hull, the first and second air channels separating the hull into a bow planing portion, a middle planing portion, and a stern planing portion, a first plurality of strakes protruding from the bow planing portion…” It also includes, as Schoell noted, a flat section aft on centerline with 0° deadrise. Figuring out the correct geometry is tricky, mostly based on repeated sea trials by experienced observers. As Richard Akers wrote in a comprehensive overview of stepped hulls (“Dancing a Fine Line,” PBB No. 85), “The design community is hindered by the dearth of pure research on high-speed stepped monohulls, especially with respect to maneuvering, seakeeping, and dynamic stability.” In the article he refers often to the work of Michael Peters (PBB Nos. 125 and 126), whose extensive work with offshore powerboat racers and the military is manifested in his patented Stepped-Vee Ventilated Tunnel (SVVT). 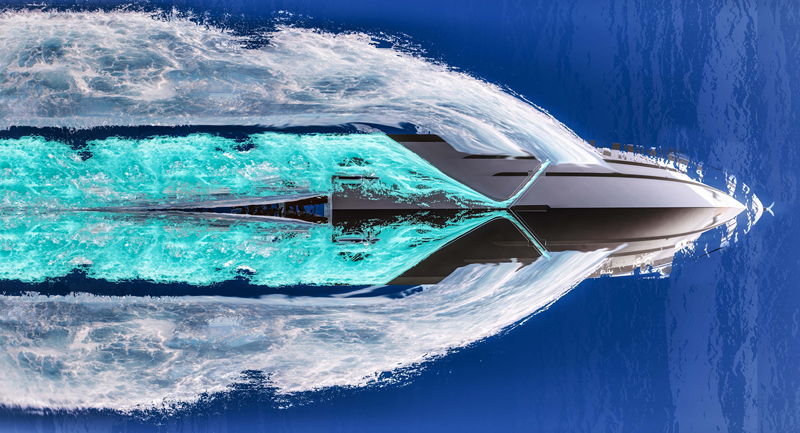 For a different spin on reducing hull drag, check out our story on Aussie designer Roger Multimer’s development of a fully aerated hull as an alternative to stepped hulls. Bénéteau’s AirStep hullform incorporates ducts on the cabin or hull sides to force air down to the running surface where chines prevent it from exiting. The AirStep models range from 18′ to 46′ (5.5m to 14m). More research and product development (350 hours of testing during 18 months) have resulted in AirStep 2, compatible with Volvo Penta’s IPS engines. This required increasing airflow and adjusting “the shape and arrangement of the steps.” The outcome: 20% more efficiency, according to Bénéteau. The patent abstracts for Kaidy’s SeaVee Z and Peters’s SVVT mention similar features, such as transverse channels. It was our hope to compare Bénéteau’s AirStep patent to these, but we could not find it in a brief search of U.S. patents, and Bénéteau has yet to provide more specificity of the patent than the comments made by Bordage and Girotti. Bénéteau America, 1313 US-76, Marion, SC 29571 USA, tel. 843–629–5300.